You need Android Studio 3+ and Node.js installed on your machine. Some familiarity with Android development and Android Studio is required. Building a stock market application has some fundamental requirements. Apart from accuracy, the application needs to also be able to update prices in realtime as the changes occur. It should also have an option to notify the user if there is a change in the price of a stock, even when they are not currently looking at the application. In this post, we will see how we can achieve this using Kotlin, Pusher Beams, and Pusher Channels. Android Studio (v3.x or later) installed on your machine. Download here. Knowledge of Android development and the Android Studio IDE. Knowledge of Kotlin. Visit the docs. Node.js and NPM installed on your machine. Download any stable release here. The first thing we want to do is create our Android application. Open Android Studio and create a new application. Enter the name of your application, StockExchangeApp, and then enter the package name, which is com.example.stockexchangeapp. Make sure the Enable Kotlin Support checkbox is selected, choose the minimum SDK, we chose API 19, click Next. Choose an Empty Activity template and click Finish. For this article, you need a Pusher application. To get this, log in to your Pusher dashboard and Create a new channel app. You can do this by clicking the Create new Channels app card at the bottom right. When you create a new app, you are provided with the keys. We will need them later. For Pusher Beams to work, we need an FCM key and a google-services.json file. Go to your Firebase console and click the Add project card to initialize the app creation wizard. Add the name of project, read and accept the terms and conditions. After this, you will be directed to the project overview screen. Choose the Add Firebase to your Android app option. The next screen will require the package name of your app. You can find your app’s package name is your app-module build.gradle file. Look for the applicationId value. When you enter the package name and click Next, you will be prompted to download a google-services.json file. Download the file and skip the rest of the process. Add the downloaded file to the app folder of your project - StockExchangeApp/app. To get the FCM key, go to your project settings on Firebase, under the Cloud messaging tab, copy out the server key. 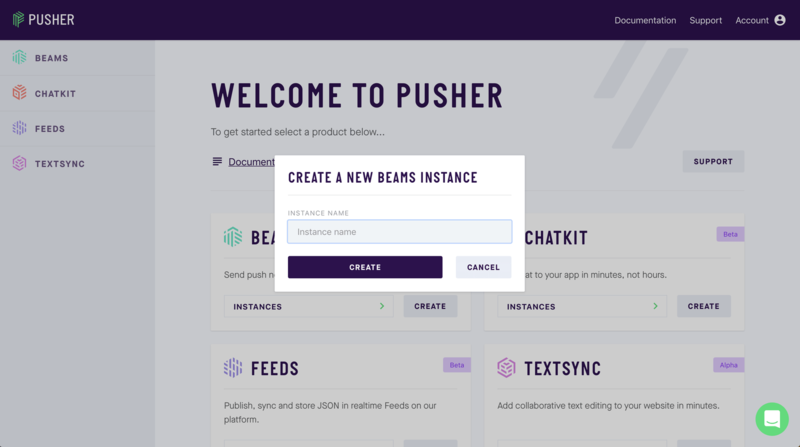 Now that we have set up our Firebase application, log in to the Pusher Beams dashboard and click on the CREATE button on the BEAMS card. After creating the instance, you will be presented with a quickstart guide. 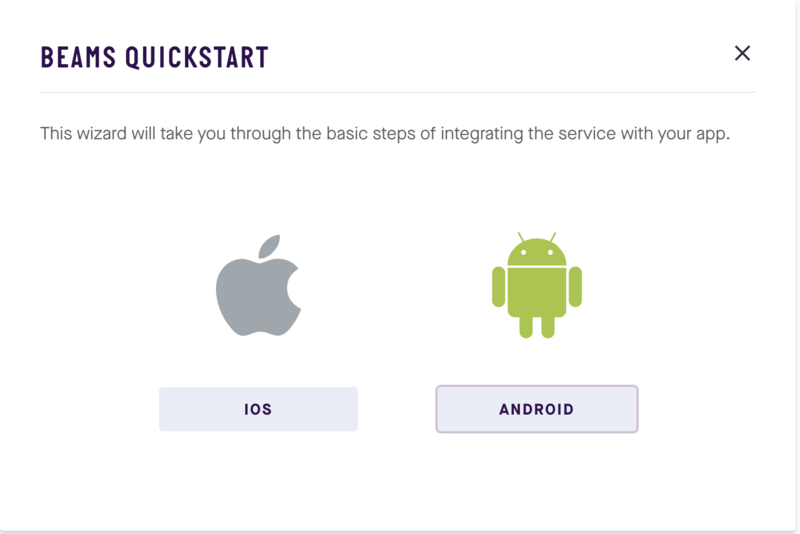 Select the ANDROID quickstart. The next screen requires the FCM key which you copied earlier. After you add the FCM key, you can exit the guide. Since this application will depend on other libraries to function, let’s pull in these dependencies so they are available to the project. So far, we have been setting up the project. Now let’s start building the application. Let’s start by tweaking the colors of the application. Next, open your styles.xml file and replace the parent theme on the app theme with this - Theme.AppCompat. Apart from the initial MainActivity already created for us, we will need a screen to manage the settings for the application. In the code above, we replaced the frame layout with a fragment. This is the recommended practice when creating a settings page. Before creating the fragment, let’s create a preference file. android:summary="Receive stock updates for Amazon"
android:summary="Receive stock updates for Apple"
In this file, we have two checkboxes to control the updates for two stocks, Amazon and Apple. The code above loads the settings from the preference file created earlier. With this, we are done implementing the settings screen. This layout has a ConstraintLayout housing a RecyclerView. Since we are using a list, we need some other utilities. One of those utilities is a data object. The object is what every item on the list will hold. Related: Getting started with ConstraintLayout in Kotlin. A data class in Kotlin generates some other useful methods we would have had to create manually if we were using Java. From this layout, each list item will show a company name, the current stock price, and it’ll show the change percentage. This class manages the display of stock items on the list. It collects an initial list passed from the constructor and uses the size of that to know how many items we have. The list can be updated with the additem, updateItem, and removeItem methods we created. The list_row layout we designed earlier is used in the onCreateViewHolder method. In the bind method of the ViewHolder class, apart from adding the values to the necessary text views, we apply a green or red background to the changePercent text view if it is a positive or negative value. For this demo, we are considering two stocks only. You can add more if you like. These stocks have a default value of 0.0 for change percent and value. This class implements the SharedPreferences.OnSharedPreferenceChangeListener interface because we will add settings functionality in the app and the callback will tell us when the settings have been updated. We created instance variables for our Pusher Channel object and the list adapter. We subscribed to the stock-channel channel to listen for stock updates. val refKey = element.name.toLowerCase() + "_preference"
Replace the PUSHER_BEAMS_INSTANCEID placeholder with the Pusher Beams instance ID on your dashboard. Remember we created a settings page earlier? Let’s inflate our menu and link it to the settings page. To do this, first, let’s first create a menu file in the menu resource folder. When the settings change, we call the setupPusherChannels method again so it binds to the stock reports we enabled and unbind from those we disabled. In the code above, when a new message comes, we check if we enabled price reporting for that stock. With this information, we know whether to display the notification for it or not. With this, our Android application is complete. Let us now build our backend server. Now that we have completed building the application, let us build the backend of the application. We will build our backend with Node.js. This file contains the meta data for the Node application. It also contains the list of dependencies the application relies on to function properly. Replace the placeholders above with keys from your Pusher dashboard. This code above contains the endpoints for our application. We have two endpoints, one to handle all the processes for the amazon stock, and the other for the apple stock. We have the handleStock method that basically does all the work. In this post, we have learned how to leverage the power of Pusher to create powerful engaging applications. You can find the source code on GitHub. Feel free to clone and explore further.